Just in case you were looking for reason to celebrate on an otherwise uneventful Monday, today is Autodesk’s 28th birthday! For those keeping tabs, that makes me 13 days younger than Autodesk; my birthday is May 9, 1982. I can’t tell if this is by coincidence or not, but I’m going to say it wasn’t. Since most employers I know prefer productivity over partying, Autodesk released AutoCAD Freestyle today, an all-new version of AutoCAD specifically tailored to individuals needing to create professional-looking drawings – quickly and easily. I had a the chance to preview the product now known as AutoCAD Freestyle back when it was an Autodesk Labs technology preview named Project Cooper. The power of AutoCAD Freestyle is its simplicity. Someone with little-to-no CAD knowledge could easily install AutoCAD Freestyle and produce a complete drawing before lunch. As anyone who has used AutoCAD or AutoCAD LT knows; it’s unlikely someone without any previous training would be able to produce a complete an AutoCAD drawing before lunch. AutoCAD Freestyle isn’t for the seasoned AutoCAD/AutoCAD LT professional who needs advanced drafting and design tools to create complex drawings. Instead think of AutoCAD Freestyle as a product your mom could use. While there’s an obvious market for homeowners needing to create drawings for a new deck, or even small landscaping companies, I can also see AutoCAD Freestyle as a potential collaboration tool. Perhaps AutoCAD Freestyle can make the “napkin sketch” so commonly passed to a CAD drafter extinct. Considering it’s price of $149 ($49 for a limited time), and ease of use, how nice would it be to receive a DWG file from AutoCAD Freestyle instead of that napkin sketch? 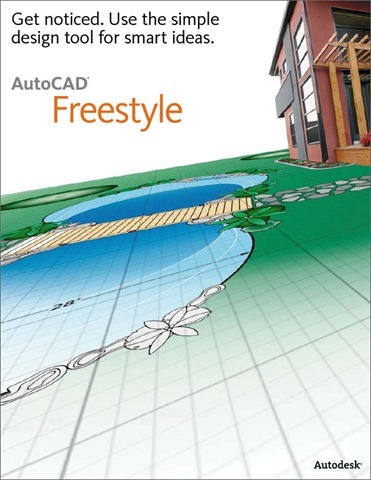 To summarize, AutoCAD Freestyle is not a replacement for AutoCAD or AutoCAD LT; it’s a product that makes nearly anyone capable of using a keyboard and mouse also capable of creating professional-looking drawings that can easily be exchanged with individuals using AutoCAD or AutoCAD LT. The idea is good, but I cannot figure out why Autodesk fumbled so badly, and made AutoCAD Freestyle, MORE crippled than the free Viewer ? Surely the smart thing to do, would have been to ADD features to the free viewer, NOT remove them ?! What's the glaring omission ? : DXF import. Thanks for helping to get the word out about AutoCAD Freestyle.